Each result is based on a three-day rolling average. Explore President Obama's approval ratings in depth and compare them with those of other presidents in the Gallup Presidential Job Approval Center. View President Trump's approval ratings daily. 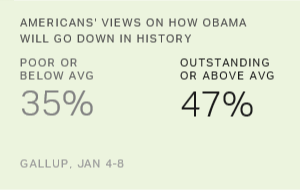 Forty-seven percent of Americans say President Obama will be regarded as an outstanding or above-average president, while 35% say below-average or poor.